Shirley Templo is a ruthless woman. Many people deal with her strong attitude only for fear of her cold stare, or her outlash. She works as a librarian in a school, and lives in a compound that is owned by her ex-husband, Benito Salvacion. Many of the Salvacion family members that live near the compound, even including her eldest daughter, Dang, plead with her to sell it so they can make a profit, and she can move to a more suitable living area. 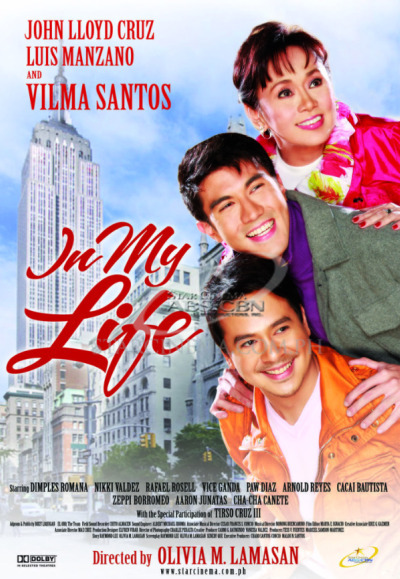 In My Life is a 2009 Philippine drama film released by Star Cinema, starring Vilma Santos-Recto, John Lloyd Cruz and Luis Manzano. The film was directed by Olivia Lamasan, and filmed mainly in New York City.